What year should the fan leap-in take place? View Poll Results: Which year should the fan leap-in take place? Pick a year by selecting it in the poll above! You mean we can only pick one? Excellent point - added an option for either year. Thanks! Either year is fine...however...we can't have a 'leap in' take place in the current year...that never happened on the show. So....how about whatever year we 'leap in' to D*C is the year at the project and we vote for the year we 'leap in' to. Some suggestions could be 1989 (the year the show started)...1995 (the year Sam leapt)...1953 (Mirror Image)...there are so many other possibilities. Might there be a QL panel? They also had a Pirate and Time Travelers Ball. That certainly fits QL. Any of these suggestions resonate? I voted for 2012. With school and everything else to deal with at that time of year, next year would be out for me. But I graduate the end of December 2011, so Sept 2012 would work for me. Plus, it gives me more time to save up for the trip. Just to give my two cents: 2012 is a "Leap Year," after all!!! As much as I'd like a reunion to be as soon as possible, I think 2012 would be the best for me. It gives me more time to plan ahead and save up. Plus, like it was pointed out in the previous post, it is a Leap Year! Is this still happening? There are several conventions I'm eying all at the end of the year, and I'm trying to narrow down which ones to attend. I'd love to do D*C, and a reunion like this would make me more inclined to go. I would love to go too - pretty quiet around here. Anyone there? Still watching the thread. Would go if at all possible. I think it should be Sept 2011 but really not fussed which year. LOL...you must really BE a time traveler. Reason I'm still watching is since 2011 didn't work out, it will have to be 2012 or later. The bigger question is, is it even going to happen? Cool, if they did an end of the world one and Sam has to stop it or something like that? Maybe the date would be December 21st 2012. Not much traffic on this topic. Looks like we might be taking a trip to Florida with the kids around that time, so that throws me out of it this time around. Maybe on the 30th anniversary in 2014 I could try again. Would be so nice to see you all again. Yeah.... I kinda caved and went to Disney World for the second winter break in a row, so 2012 ain't happening for me. Plus, I'm STILL in college (UGH, when am I ever going to be done?!)... 2014 could work for me. 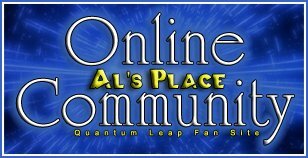 I really hope that someday soon I'll get the chance to meet my friends from Al's Place in person. I've been friends with many of you for over a decade; I can hardly believe it! Yeah, 2014 is probably best. I'm sort of all conventioned-out this year, and 2013 is the Doctor Who 50th anniversary, so I'll be hitting various cons to celebrate that. So we may as well go for 2014. Ah man, I should think about planning to go to at least one DW con next year. Wasn't even thinking about that. Maybe the one in Chicago, or maybe TimeGate (which would be double-fun). Rumor has it that Gallifrey One, the big one in LA, is trying to get David Tennant... I already have my ticket to that one! I'm hoping for Colin Baker to come to at least one convention, because whichever one that is, that's the one I'll aim for going to. He comes to American cons often enough that you should be able to meet him somewhere! He's on my 'must meet' list as well. No date or location has been picked, so there's no way it would be this year. 2013 at the earliest. Wish we could have make it happen. I am really hoping hat next year we can get better organized on this. I have a family trip planned to Orlando too close to the dates we chose, so there was no way to expense two trips this year. If there is real interest in doing this, we'll find it! 2014 is the 25th anniversary, right? I wouldn't mind something then, especially since I already have some things lined up for 2013 and will probably be broke (LOL, I know, this doesn't revolve around my bank account, but still...) I won't expect something huge like the Leap Back con, but this would give everyone time to come up with something fun!